The Nikara Yala 1 is found near Yala National Park in the Kirinda district of Sri Lanka’s southern coast. With direct access to Nidangala beach, where you’ll find many a rocky boulder atop which you can sit for hours simply gazing at the crashing waves and being mesmerized by the sunset. 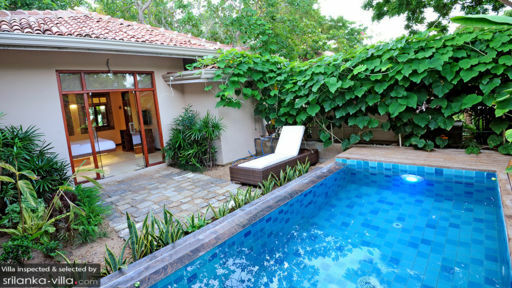 The villa offers two private, one-bedroom villas with a plunge pool for the more private guests, who are looking to stay in a tranquil setting surrounding by nothing but abundant nature. Each of the two bedrooms at these villas sport a spacious layout with an airy ambiance owing to the large glass doors that open out to the plunge pool. Views of the garden can be enjoyed straight from the king-sized beds which is found on a raised, contemporary-style platform. Behind the beds, you will find wall tapestries with animal print for a nice opulent touch to the bedrooms. 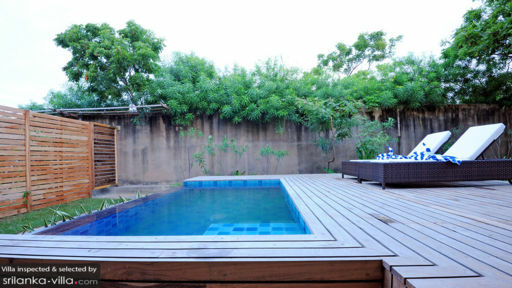 For amenities, the rooms are air-conditioned, fitted flat-screen TVs, ample wardrobe space, writing desks, etc. There are en-suite bathrooms for each bedroom and both of them are partially open-air, surrounded by verdant foliage including a cashew tree for one of the bathrooms. With necessary modern facilities, there are tropical showers for the comfort of guests. The private villas are covetous owing to their proximity to the lush gardens where you have several varieties of plants and trees to keep the fresh air even fresher and clean. Amidst this refreshing ambiance, guests can walk along the grass, head to the beach, or simply laze around the gardens for a relaxing time. 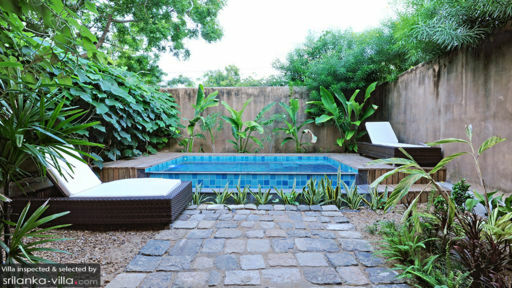 Both villas lead to the back garden with cashew trees and frangipani flowers, along with a private plunge pool flanked by a timber pool deck. There are sun loungers upon which guests can laze endlessly and sunbathe under the tropical sunshine. Within the bedrooms, to ensure the space remains private and you have everything you need, the villa offers ample sitting space, a writing desk, as well as coffee and tea facilities. You can simply lounge beside the pool or in your bedrooms, but if you wish you can head to the villa living areas and porch which has been furnished with plush armchairs, where you can relax while gazing at verdant gardens. Surrounded by walled gardens, guests’ privacy at the villa is ensures for relaxation without interruption. The villa offers alfresco dining areas for both the private villas, out on their individual balconies for an intimate candlelit dinner under the stars. As you enjoy the fresh air, you can relish the heart feast that is served hot! The villa itself offers many amenities to guests including a restaurant that serves organically-sourced food, and since the villa has been designed in an eco-friendly manner with reclaimed wood, solar energy etc. it is truly a natural retreat for wellness and healthy living. The staff is helpful and will look after the necessary upkeep and management of the villa grounds. The villa is located at a pleasant spot from where you can view the ocean and even step outdoors to head to Nidangala beach, where you have the famous Nidangala rock – an excellent sunset point. Yala National Park is right next door, and if you’re lucky you can even spot a leopard or two! Bundala National Park is another great adventure, especially for the birders as there are many migratory birds that make it their home.